If you find yourself without air conditioning on a hot day, don’t delay in calling AC Contractors for Gladewater residential AC repair. We have the resources to serve our customers quickly, efficiently and economically. As the leading residential AC and heating company in East Texas, we hold our standards high. You can count on us for reliable service, competitive rates and experienced technicians. If your air conditioner breaks down or is just acting strangely, give us a call and we’ll be happy to provide you with a free estimate. Remember, a residential AC repair in Gladewater TX is always cheaper and easier to fix when it’s small! Don’t wait to call us! Here are some of the most common problems that homeowners face with their AC systems. Most can be fixed on the spot with our fast, dependable Gladewater air conditioning repair services. AC Contractors is the largest residential air conditioning and heating company in East Texas. 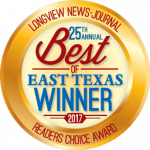 With over 25 years of experience, we are proud to say that we’re established as a trusted residential air conditioning service in Gladewater TX. We have excellent reviews, are a top choice for locals and have an A+ rating with the BBB. Technician Seal of Safety – you can trust our technicians with your home and family! Are you ready to schedule your appointment for Gladewater residential AC repair? Call AC Contractors for a convenient appointment or to request your FREE estimate. If you are looking for Longview and Tyler area air conditioning, heating, and indoor air quality specialists then please contact us at 903-759-4250 (Longview) | 903-581-9537 (Tyler) | 800-287-0715 (Toll-Free) or complete our online request form. © 2019 A/C Contractors, All Rights Reserved.